Showroom Hours: Open Everyday from 10am-5pm. Closed on Wednesdays. PLEASE NOTE: Most of our items will be shipped by freight truck in a custom wooden crate. Please contact us by phone or "Ask a question about this product" to work out shipping details. 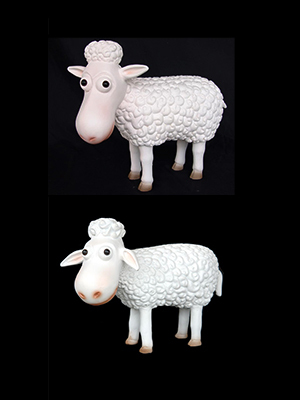 Small Funny Sheep Statue made of Fiberglass Resin Material with the option of Ears Up or Down, or in Black Finish as shown in the Bottom Photo! Our fiberglass statues are unique that each individual one is handmade and painted. Our life size statues are available for purchase! We also offer local rentals in the Tri-State Area. We do not include shipping with our prices because we work with all of our clients on the best possible shipping quote we can get to their area. We also provide bulk shipping. If you purchase multiple items, we can fill up the crate with the largest item and the other smaller statues ship for FREE. We are the only company that provides this service because our warehouse has a wood shop inside. In providing this service, we have built great relationships with our clients. No matter a business or a residential buyer, we work closely with all clients to provide the best service on the market. For our business customers, we work with them to provide the perfect statue to draw attention to their business needs. We can do custom paint here on site if a company would like to incorporate their business colors or logos. These life size statues have made many of our clients landmarks in their town, drawings loads of people in taking pictures with the statue. Many of those photos turn up on social media acting as free advertisement for our customers business. We always hear from our customers that their business foot traffic has increased from adding a statue! Our clients include Bloomingdales, Bergdorf Goodman, Ralph Lauren, Michael Kors, Ben and Jerry, and many other small town family owned business like ours. Some of our fun projects have included pirate themed restaurants, miniature golf parks, safari themed resorts, TV show props, Parades and statue rentals for fundraises, events, and parties! One of our favorite projects was for a school that purchased 10 baby calf sculptures. Each class painted the baby calf and then auctioned them off at one of their fundraisers. Out of the 10 calf statues auctioned, the school was able to raise over $30,000! The kids sent us photos of the cows they painted. It truly was an amazing experience to be part of such a great cause. The school now plans on doing this yearly. Our statues are formed out of plaster first and then sprayed with a rubber like material to take the plaster shape. One the rubber has cooled; we fill it with fiberglass which pours as a liquid. Fiberglass is threads of thin glass forced from heating molten glass through a very fine sieve. Once the fiberglass has cooled, it takes the shape of the mold. Fiberglass is a great material to work with. Not only is it an affordable medium to work with, it is light weight and very strong, similar to a boat hulls. They are designed to withstand the elements without breaking. Lifesizestatue.com is proud to offer our customers with an amazing variety of fiberglass sculptures and figurines. For businesses and homes, there is something for everyone. If You can Dream it, we can Make it! Yes, we make custom statues! Our experienced team of designers can help you achieve your vision, whether you need a 16 in. pizza pie or 20 ft. horse. Custom sports figures, props, restaurant signs and statues are just some of the projects we have created for clients from New York to Malibu. Custom doesn't always mean expensive, we can utilize a variety of materials and methods to suit most budgets. We can assist you with your concept, help improve existing designs, and deliver the entire process for mass production of a unique "Custom product". We can provide the solution from a simple concept to delivery! Our team is capable of making Monumental items as well as smaller products. We can mass produce your product from one item to thousands. Some of our clients include Capital One, Disney, Polo Ralph Lauren , Marc Jacobs International, Bergdorf Goodman, Dolly Parton's Dixie Stampede and others.